The town of Duck is one of the more popular and upscale towns in the the Outer Banks. There are some decent running options. A good ~5 mile route combines the Duck Boardwalk and a section of Highway 12. 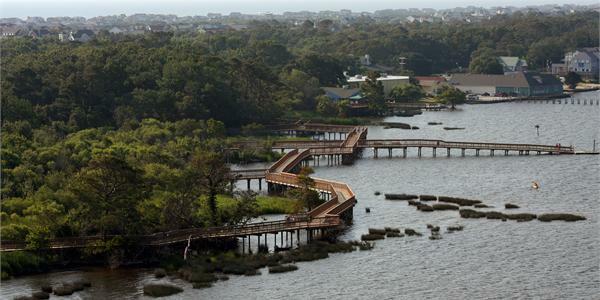 The 0.8 mile wooden boardwalk along Currituck Sound has great water views, but can be crowded. Especially nice at sunset! Continue on Highway 12, heading north toward Carolina Dunes, along a sidewalk/bike path. Intermittent water views. Add-On: Can continue north of Carolina Dunes, although water views are uneven. South of Duck, the road turns more inland. Another good option is to weave in and out of the residential side-streets in Duck running east of Highway 12. Each one is ~0.5 miles, ending at the beach. Some are a bit hilly — a rarity in these parts! The beach in Duck is also great for running, although we hear access is limited to those living in the residential communities at certain times (and few parking options).